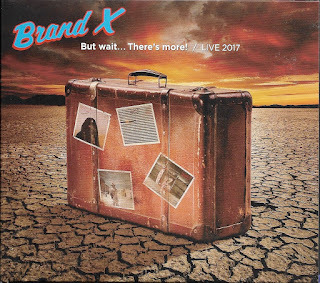 This Sunday Music Muse Day has me centering on one group, Brand X, who was one of my favorite Rock-Fusion groups from the 1970. One of my favorite record shops, the Bop Shop Record presenting at one night gig at the Lovin' Cup a local bar/restaurant/music room. I could resist picking up ticket (my good friend Bruce Younger agree to go with me. Thanks Bruce). I got a chance to talk to guitarist John Goodsall briefly. Hearing the music played live Thursday night brought back great memories. Of course, I had to pull out all their old albums and give them another listen. Plus, reviewing the band's history online, you find it had rotating roster of players and the usual conflict with their record company, in it want them "to be more commercial", like adding vocals and trying for hit singles. That's the kiss of death for adventurous instrumental band. Brand X did fade from the spotlight for awhile. I'm glad to see them back. One aspect remains, their humorous album and song titles. Some of that had to do with they friendship with two of the members of Monty Python. In fact, Michael Palin wrote very funny liner notes for the "Do They Hurt" LP. I also picked up some other albums that members of Brand X played on as sidemen. The David Bendeth Band was the opening act for Brand X on the Canada concert I attended. The Canadian guitarist only made three albums, which featured bassist Marcus Miller, drummers Lenny White and Billy Cobham. then Bendeth quit performing and went on to a success career producing and song writing. So, all in all, this was a nice trip down memory lane. This week's Sunday Music Muse Day I'm still finds me listening to the music of John Abercrombie, who passed away last week. It gives me a change to pull out his vinyl records and play them through the ION turntable I have connect to my computer. But, I do have two new selections to share. 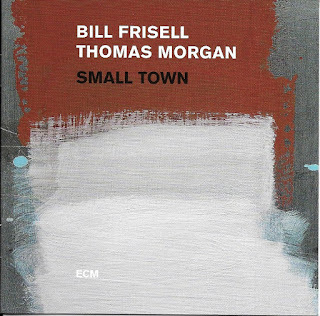 First is Bill Frisell and Thomas Morgan Small Town. I missed this guitar and bass duo when the played the Xerox Rochester International Jazz Festival, held here in June. I won't pass up a chance to see Frisell again. Second, is Larry Coryell Live from bahia, a breezy CD from the late great guitarist, who we also lost recently. This CD features drummer Billy Cobham, former member of John McLauglin's Mahavishu Orchestra, his him solo bands, and countless other musical credits. I'm happily finding filling gaps in my Coryell collection. So, that it for this week. Remember, music is you friend, and as a like a good friend it can help you through this stressful times. Make use of that friend.